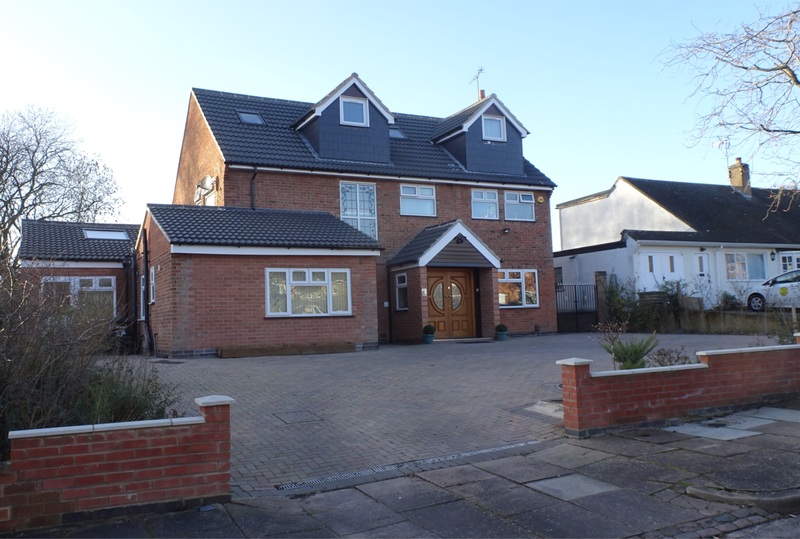 We are pleased to offer this extended 6 bedroom detached family home which is on a spacious plot of approximately 0.31 acres within the charming city suburb of Stoneygate. This extensive home is over 3,000 sq ft and is beautifully presented boasting a thoughtful design and practical element throughout. Benefiting from direct transport links to the inner-outer ring road to the M1/M69, in close proximity to outstanding public and private schooling, health centres and all local amenities. 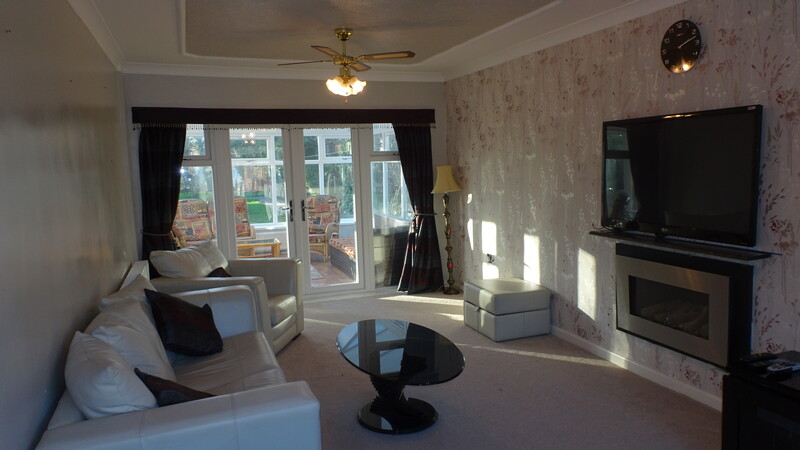 The property comprises a spacious entrance hall, living room, family room, a light and airy open plan kitchen/diner, utility room, a sizeable gym and ground floor shower room, conservatory and a WC. The first floor includes 4 bedrooms with one en-suite and a family bathroom. The second floor contains 2 bedrooms both with an en-suite. 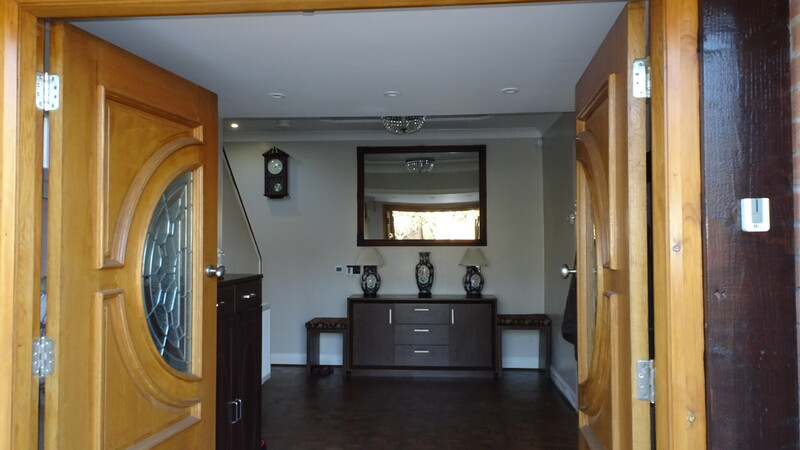 This home benefits from gas central heating throughout, CCTV security alarm system, inset LED lights throughout, uPVC double glazing throughout. In addition there is underfloor heating in the kitchen/diner and the family room, a large in-out block paved drive providing ample off road parking, access to the rear via a side gate, and a large pleasant patio with Indian sandstone paving slabs adjoining the rear of the property to the private landscaped garden. Entrance Porch: Having a brick built storm porch with a gable roof, uPVC double glazing to the side elevation and an Oak Empress External double doors with stained glass detail. 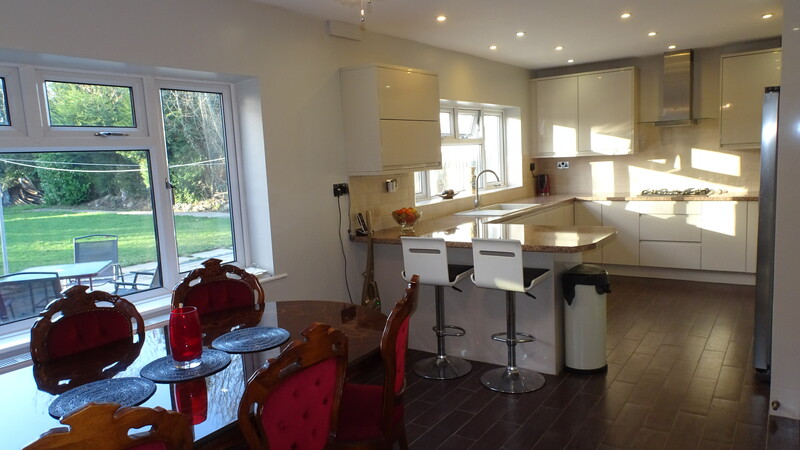 Kitchen/Diner: 25’3” (7.7m) x 11’5” (3.5m): Having tiled floor with under floor heating, central heating radiators, comprehensive range of wall and base units with roll edge work tops, a breakfast bar, a gas 5 ring hob with extractor hood and fan, granite sink and drainer with brushed steel mixer tap, in built double oven, integrated dishwasher, an American style fridge/freezer, dining area, pantry, a ceiling light with fan, a television point, ample electrical sockets and oak veneer glass panelled double doors. WC: Having a frosted uPVC double glazing to the front elevation, tiled flooring, tiled walls, a low level WC, hand wash basin with vanity unit and an extractor fan. Family Room: 26’0” (7.9m) x 15’2” (4.6m): Having under floor heating, central heating radiators, wooden flooring, a feature skylight with an opulent feature chandelier, television point, ample electrical points, French doors leading to the rear garden and single door leading to the side/front. Gym/Bedroom 7:16’6” (5m) x 9’6” (2.9m): Having uPVC double glazing to the front elevation, carpet and ample electrical sockets. Shower Room: 8’0” (2.4m) x 5’0” (1.5m): Having frosted uPVC double glazing to the side elevation, tiled flooring, tiled walls, a luxury superior steam shower cubicle, a low level WC, hand wash basin with vanity unit, electrical shaver socket, extractor fan and a black gloss towel radiator. Utility Room: 8’0” (2.4m) x 5’0” (1.5m): Having frosted uPVC double glazing to the side elevation, a combi boiler with megaflow water storage tank, fitted worktops with plumbing under for washing machine and ample electrical sockets. 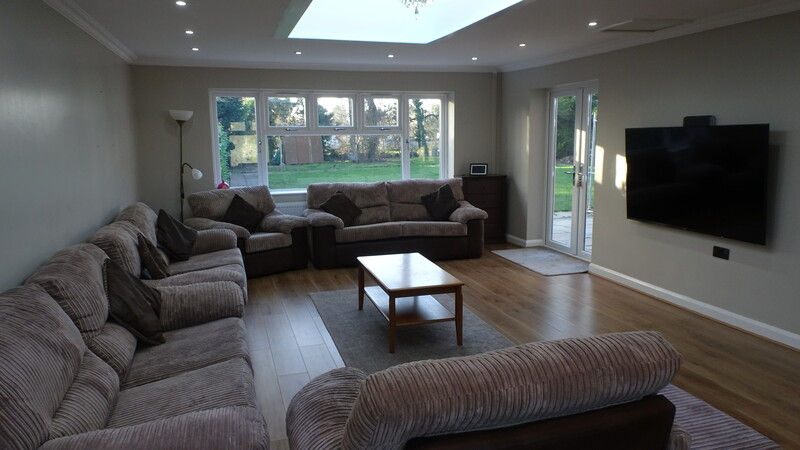 Conservatory: 14’0” (4.26m) x 11’7” (3.5m): Having uPVC double glazing construction up to a low pitched roof with lighting, wooden flooring and a French door leading to the garden. En-suite: 8’10” (2.4m) x 5’7” (1.75m): Having a frosted uPVC double glazing window, tiled floor, tiled walls, corner shower cubicle with dual shower heads, hand wash basin with vanity unit, low level WC, black gloss towel radiator, shaver socket and an extractor fan. Bedroom 2: 12’1” (3.6m) x 11’4” (3.5m): Having bespoke fitted wardrobes, carpet, a ceiling light with fan and ample electrical sockets. Bedroom 3: 11’8” (3.6m) x 11’2” (3.4m): Having bespoke fitted wardrobes, carpet, a ceiling light with and ample electrical sockets. Bedroom 4: 13’6” (4.1m) x 7’1” (2.1m): Having carpet, a ceiling light with fan and ample electrical sockets. Family Bathroom: 10’6” (3.2m) x 8’7” (2.6m): Having frosted uPVC double glazing to the side elevation, tiled walls, tiled floor, four piece suite including corner panelled bath, walk-in shower, low level WC, off-white gloss towel radiator and wash hand ba-sin with large vanity unit and an extractor fan. En-suite: 7’3” (2.22m) x 6’2” (1.9m): Having frosted uPVC double glazing window to the rear ele-vation, tiled walls, wooden floor, shower cubicle, hand wash basin with vanity unit, low level WC, off-white gloss towel radiator and an extractor fan. En-suite: 7’8” (2.39m) x 6’4” (1.98m): Having frosted uPVC double glazing to the rear elevation, tiled walls, wooden floor, shower cubicle, hand wash basin with vanity unit, low level WC, off-white gloss towel radiator and an extractor fan. Outside: The property is set back from the road with a large in-out block paved drive providing ample off road parking. There is a gate to the side of the property allowing access to the large landscaped garden which is patio, lawn area, shrubs, trees and hedges. Leicester City Council - (0116) 454 1000. The services, fittings and appliances (if any) have not been tested by the agents. The property falls within Council Tax Band ‘E’ which is £2,164.00 for the year 2018/19. By appointment through the sole selling agent.